Black Friday is fast approaching, which means there are lots of deals soon to be had… provided you’re smart about it! Here, we’ll provide you with our top tips for Black Friday shopping, so you can mentally and physically prepare yourself to get the best deals on the products you want, whilst keeping your sanity intact! One of the major shopping days of the year, Black Friday falls the day after Thanksgiving (the fourth Thursday in November) in the US. Whilst it’s not an official public holiday in the USA, many people have the day off. It’s become increasingly popular in the UK, with retailers heavily discounting their goods (especially electronics, but also toys, apparel and appliances), with deals sometimes better than those found in the Boxing Day sales. There are a couple of different versions of what Black Friday actually means. One theory is that the term was coined in the 1960’s, referring to the kickoff of Christmas shopping. “Black” refers to stores making a profit, because when accounts were done by hand, red ink indicated a loss, whereas black showed a profit. Another theory about how Black Friday got its name is that it was coined by the Philadelphia Police department, referring to the congestion of both vehicle and pedestrian traffic in the city due to the crowds going shopping in the run up to Christmas. However, the term Black Friday also has a non-retail meaning, referring to the financial crisis in 1869. Back then, a stock market catastrophe occurred, originally set off by gold spectators who tried and failed to corner the gold market, which caused stocks to plummet. This year, Black Friday 2018 falls on Friday 23rd November. However, the sales often stretch over the long weekend to Cyber Monday, which is another day that’s known for retailers offering great deals. Our advice for Black Friday shopping is if you don’t have time to search for deals on the actual day itself, don’t worry, as you’ll still be able to grab a bargain all weekend. Black Friday is only a good idea if you get what you need, for a good price. The question is, how do you go about that? Our Black Friday strategy tips will reveal all…! So, set a budget and stick to it. One way to help with this is to create a list of items you’d like to buy, and make sure you don’t veer off track. A Black Friday strategy tip you shouldn’t ignore is do your research in the run-up to the big day. Set price alerts a month before for the items you want, so you can see if they change over time. You may well start to see an increase in prices directly before the big day, making you realise that those so-called “great deals” are just a cheap tactic from some retailers. That’s not to say all retailers are like that, as there are many genuinely good deals to be had on Black Friday; but of course, you want to make sure you get the most for your money. If you’re not already following your favourite brands on Twitter or Facebook, now’s the time to do it; as you’ll likely be one of the first to know about flash sales and extra discounts. Another of our top Black Friday tips is to sign up for newsletters too, as you have a much better chance of getting further discounts, seeing as you’re a “loyal customer”. If you know the number of emails are going to annoy you, then set up a separate email address dedicated to retail newsletters – it takes minutes, it’s free, and the discounts alone will be worth it. Sometimes you’ll buy something, take it home and realise it simply isn’t right – and there’s nothing wrong with that. However, a crucial Black Friday spending tip is to be familiar with your chosen brands’ returns policies before you decide to buy an item (unless you’re absolutely 100% certain you won’t be returning it). So, a crucial tip for Black Friday is to understand the returns policy so you don’t lose out if you decide to take it back at a later date. You can find out more about refunds and returns here. It can be hard work discovering all the deals yourself, but there’s help out there. There are Black Friday apps available, where people can share their best Black Friday finds, so others can get great deals too. You can search a range of brands at once, and you get instant notifications on the top discounts. This Black Friday, avoid the super long queues and potential fights, and shop for deals in the comfort of your own home. Our Black Friday online shopping tips will still ensure you get the best deals. Before Black Friday begins, create online accounts at all of the brands you want to shop at. Keep your details stored so that on the day, you can purchase your products as quickly as possible. Some websites will even let you save items, so you can access them easily. If you have a credit card, then one of our top Black Friday tips is to buy products using your credit card, as opposed to your debit card. This is because, in the unlikely event your items don’t turn up, or they’re not as promised by the seller’s site, then your credit card company has a liability, and they should be able to refund you the money. If you’re making a purchase and you’re in any way unsure, but still want to go ahead, then take screen grabs of both the items and your order confirmation, so you can prove to the bank that either your items weren’t delivered, or weren’t as promised. This isn’t guaranteed, but if you’re not 100% sure on an item (and you’ve ignored our tip on only buying what you genuinely want and is on your list! ), then our Black Friday advice would be to log into the retailer’s site, add the item in question to your basket, then close the window without paying. Later on that day, you may well receive an email from that particular retailer, offering you extra discount on the product you left in your bag. It’s not 100% guaranteed, but it’s certainly worth a try! As online shoppers, we’re much savvier nowadays, but scams are becoming increasingly sophisticated and can trick even the best of us. Make sure you only stick to trusted websites that have the padlock sign and/or https:// at the beginning of their URL (this shows they’re secure). As with any online accounts, this Black Friday make sure all of your retailer (and email) accounts have strong passwords with a mixture of letters, numbers and special characters, and never click on any suspicious emails you receive. Just because you didn’t get a great deal on the item you wanted, it doesn’t mean you should give up hope. One of our Black Friday online shopping tips is to not forget it’ll soon be Cyber Monday! Deals are on offer throughout the weekend, and you may well find that fresh stock and further discounts have appeared on Cyber Monday, so you can still get that item you want for less. Who remembers the brawls at several supermarkets back in 2014, with people literally wrestling each other for discounted TVs? With witnesses describing shoppers “like animals”, and scenes like a “war zone”, make sure you stay safe with our Black Friday shopping safety tips. Yes, shopping can be fun… but realistically, Black Friday shopping is NOT fun, especially if you’re a child. One top black Friday safety tip is to leave your kids at home with your spouse, babysitter or over at their friend’s house – you won’t want your kids getting bored as you’re waiting in a long queue… and what happens if they were to wander off and get lost in a crowd of people? You may well be using your credit card, but if you’ve brought cash with you to spend, then obviously you don’t want it to be stolen. Wear a cross-bodied bag so you can safely stash your cash and phone away from pickpockets. Also, if you’re shopping at any high-end brands, put purchases in a non-descript carrier bag, to make you less of a target. It’s a whole different story when you’re considering safety tips online. As we’ve already mentioned, you should make sure you only shop on trusted, secure websites, and avoid clicking on any unknown emails offering “amazing deals”… no matter how tempting they are. Also, be wary of social media apps – especially Facebook and Whatsapp. Fraudsters have been known to post “great” deals on Facebook, offering free gifts and money off all kinds of products, which are total lies. So, another one of our Black Friday helpful tips is, if the deal looks too good to be true, then it probably is! One way to tell if a deal is genuine, is to look at the brand in question’s page. If they have a blue tick next to their name, then they’re verified by Facebook, which means the deal is real. When it comes to WhatsApp, fraudsters can send messages that look like they’ve been sent from one of your contacts. The message may offer a discounted gift card, and if you click the link, you’re asked to enter your details. Do NOT enter your personal information, as fraudsters can then use that information. The best tip for online safety during Black Friday is never to act on those types of messages, even if you think it’s come from a friend. Our main advice for Black Friday shopping is to be prepared – especially if you’re going to shun online and hit the physical shops. Our Black Friday survival kit will help you to ensure you stay top of your game all day, helping you to get those best deals! Let’s face it, if you’re shopping in-store, it’s going to be a long day. Bring snacks and water with you, to keep you hydrated, and keep the hunger pangs away. It can be very cold in November, but when you’re in a store with hundreds of other people, it can soon become unbearably hot. Wear several layers so you can take them on and off as required – the last thing you want to do is overheat! You’re going to be on your feet all day, so when you consider your wardrobe, don’t forget to wear a pair of comfy shoes! Whether your comfiest shoes are a pair of trainers, or your winter boots; make sure you wear something that you can walk in all day without getting blisters. We’ve a range of brands that specialise in comfy but stylish shoes, such as Cushion Walk, Dr Keller and Heavenly Feet, so there’s no excuse for sore toes! If you’ve followed our previous Black Friday shopping tips, then you’ll have already written a list of all the items you want to purchase. When you’re in-store, it can be tempting to grab all the deals, but stop and refer to your notebook. Bring a pen so you can tick off the items you’ve bought, and you’ll soon see how successful your Black Friday shopping trip has been! To conclude, Black Friday can be a great time to bag a bargain or two, but only if you’re smart about it. 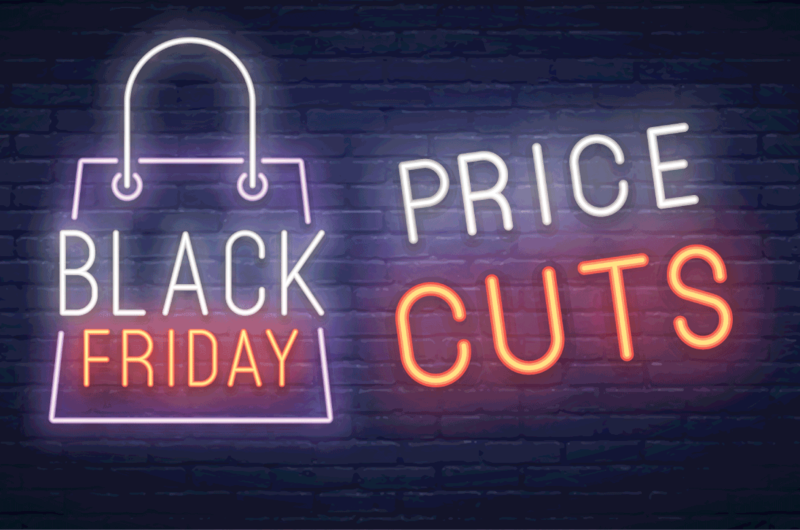 Whilst long queues and trawling through numerous products to find that one bargain isn’t many people’s idea of fun, our Black Friday survival guide will help to prepare you for the sales, so you can be smart about it and get the deals you want for the best price. What are your top Black Friday tips? If you think we’ve missed anything off, we’d love to hear from you! Alternatively, for more money saving tips and fab fashion advice, head on over to our blog.